If you’re part of the Act of Aggression beta, then from today you can play as a brand new, third faction. The Cartel is a PMC sporting some of the most advanced gadgetry in the game, and you can see how they function in the trailer below. Joining The Chimera and US Army, The Cartel offer an approach based on camouflage, detection, and advanced weaponry. They can be tailored to your specific playstyle by choosing tech from two different trees: Legal and Black Ops. 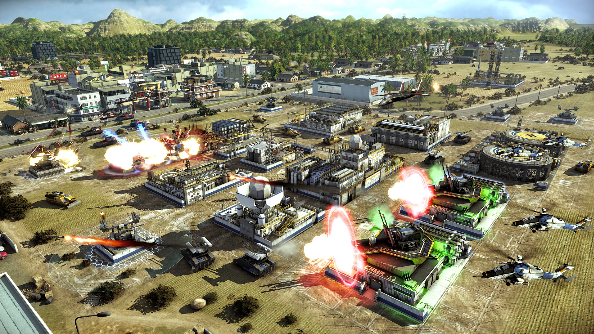 The latest update to Act of Aggression’s beta doesn’t just bring the Cartel with it though. There’s also three new maps, and new free-for-all game mode, and a change to the camera to allow a more zoomed out, wider view of the battlefield. To get into the beta, you’ll need to pre-order from Steam. Act of Aggression releases September 2nd.